Updated procedure to use a transparent background for the brush pattern. Also broke down certain steps into more details. Photos of open star clusters always appear to be more pleasant when stars have diffraction spikes. But if your telescope does not have support vanes from a secondary mirror you are out of luck. One solution is to simply tape in a cross pattern some string or fishing line over the dew shield. Or you can turn to digital enhancement. Below is a procedure to enhance your photos by digitally adding diffraction spikes using GIMP 2.8. in 8 easy steps! No special plugin or filter required. 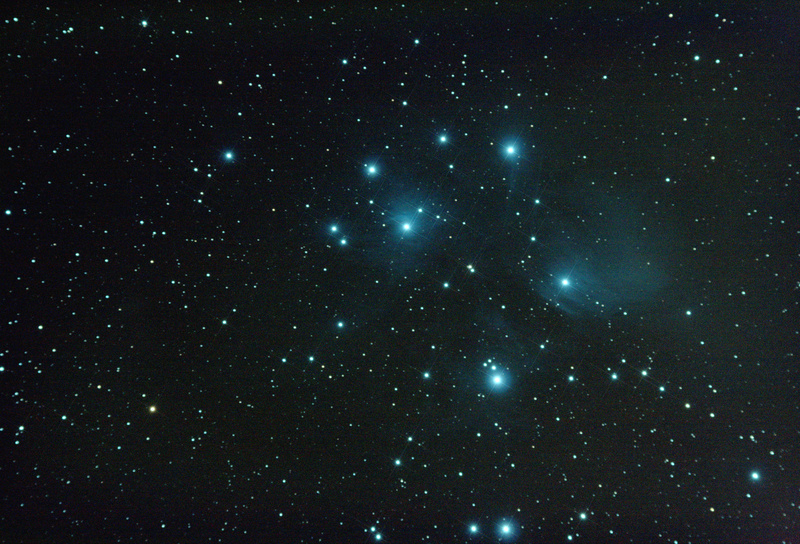 Lets try with my image of M45 – Pleiades taken with a Skywatcher 80ED. Then draw a grey straight horizontal line. 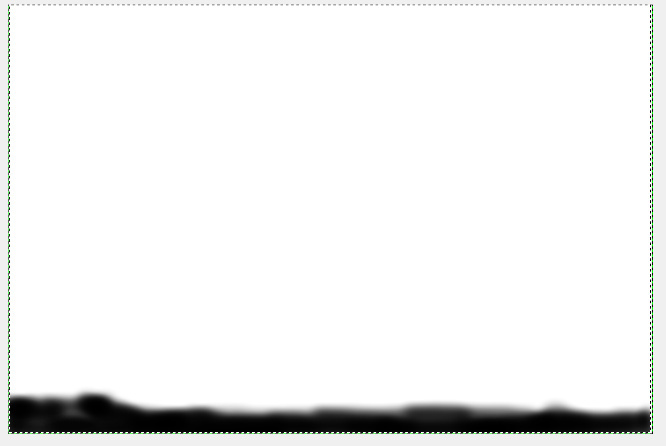 I’ve used the Pencil Tool to create a thin solid line, 4 pixel width end about 300 pixels length. To ensure a straight line, click once to mark your starting point and holding the SHIFT+CTRL keys click again for the end point. Note that my line isn’t centered, that is because the blur performed in the next step will shift the line to the left. Next use Motion Blur to create the gradient (Filter > Blur > Motion Blur…) The blur angle must be 0 deg such that it’s in the same direction as the line. In this example I’ve used a blur quantity of 150. Add motion blur to create the gradient. Once both layers align, you can merge them into a single layer. Finally, using the Ellipse Selection Tool, select the cross and Copy to clipboard. This will automatically assign it to the Clipboard Brush (red arrow and box below). Note that I have kept the screenshot of my previous version with the black background in the snapshot below to make it easier to see. We now have a new brush type that can be used to create diffraction spikes with nothing more than a single click. Yay! The Paintbrush will show up as a cross but with dotted line (see red arrow in screenshot below). Size and angle can be adjusted via the Tool Option Box; see below sections with red boxes. I use the Paintbrush tool to create the spikes. Now it’s time to get down to business and add those diffraction spikes to the stars. 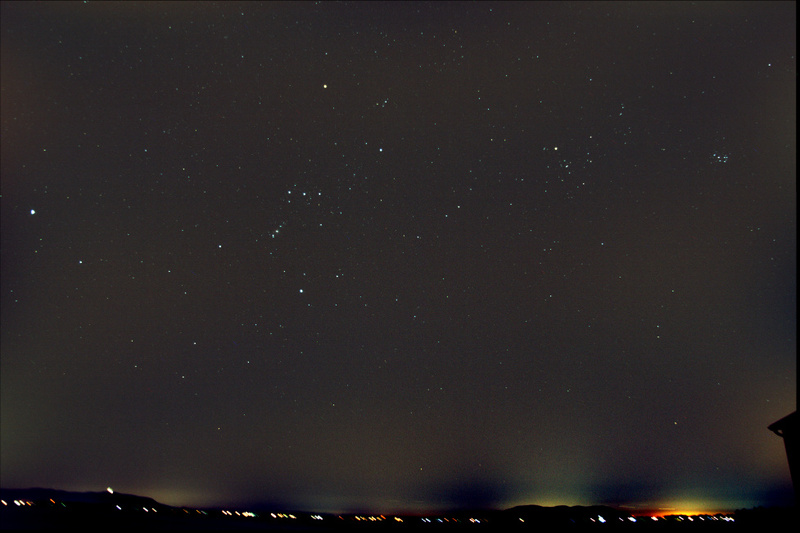 Start by opening your astrophoto and duplicating into another layer. This duplicate layer will be blurred and used to transfer the colour information on the spikes. In the duplicated layer (with the original layer turned off), use a heavy Gaussian Blur (Filter > Blur > Gaussian Blur…) to blend out the colours. In this example, I used a blur value of 60px. As the blurring makes the image darker, use the Curves Tool to bring the brightness back up. Now create a Layer Mask for this blurred layer. Select to initialize the Layer Mask to Layer’s alpha channel. 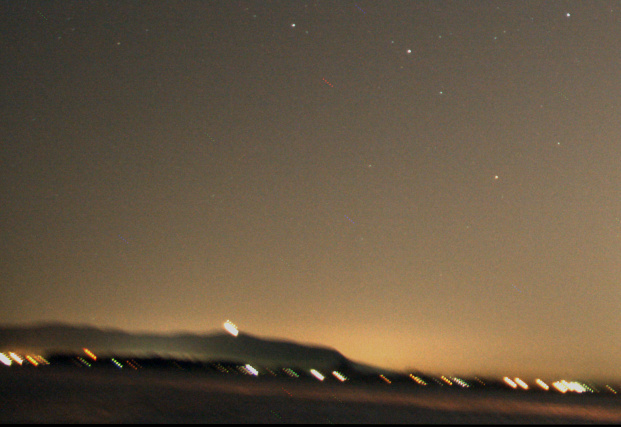 With both the original and blurred layer visible. The blurred layer is selected and the blend Mode is set to Screen. 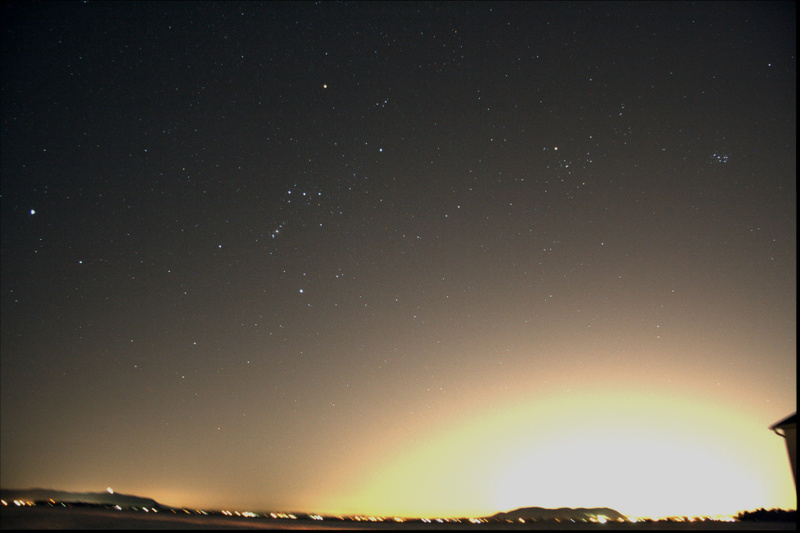 Select to edit the mask of the blurred layer (right mouse-click on the blurred layer), and click on the stars to draw the cross pattern. A diffraction spike should instantly appear! As your Brush is the cross pattern, you will see in dotted lines the size and angle. If you don’t see your cursor, simple adjust the size (ex: 500). Try different settings (a larger pen width for the initial cross pattern) or playing with the quantity of blurring and curve adjustment of the blurred layer. If you have other improvements or suggestions, please share using the comment field below. Found a way to create fake diffraction spikes using GIMP. Process comes down to defining a new brush in the shape of a cross, and then using that brush to create spikes in a new layer. Will post a procedure in the next few days. Eclipses happen in a relatively short time span and the change can be dramatic, therefore they are great candidate for GIF animations. Below is a sequence of 24 individual photos taken with a Skywatcher 80ED telescope and Canon XTi camera from the February 2008 Lunar Eclipse. 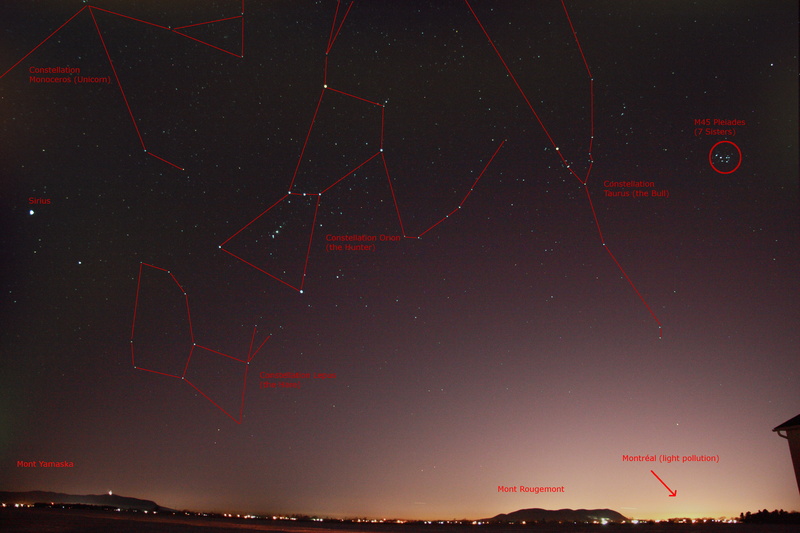 Registax – astro-imaging processing software used to align the individual images in order to ensure the Moon remains centered. In GIMP, GIF animation is done by assigning individual images to a layer. The animation is therefore build frame-by-frame as it cycles through the layers. A simple animation tutorial is available to step you through the process. On the other hand, if you prefer to make a movie, Picasa is capable of creating a video from a series of photos.